EGaming, Subscribe To Humble Monthly For Just $12! 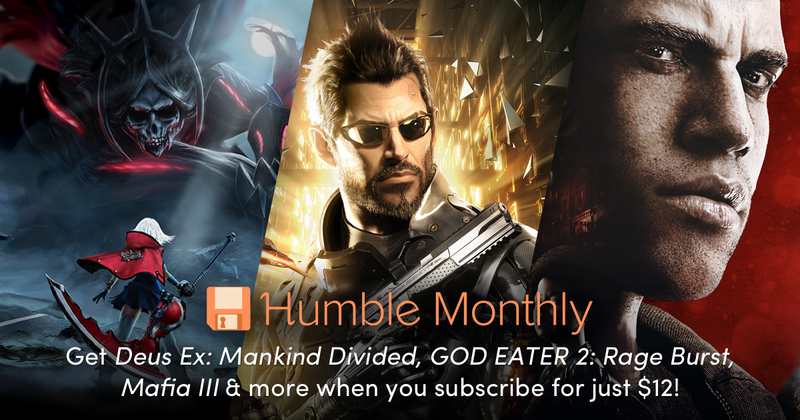 We’re offering a special promotion to Humble Partners promoting Aprils’s Humble Monthly Early Unlock games, Deus Ex: Mankind Divided, GOD EATER 2: Rage Burst, and Mafia III + Sign of the Times DLC. Humble Monthly is a curated bundle of games sent to your inbox every month. Each month offers over $100 worth of games for just $12! Every game is yours to keep and 5% of each month’s proceeds support charity. All subscribers receive 10% off in the Humble Store and exclusive access to the Humble Trove of DRM-free games.